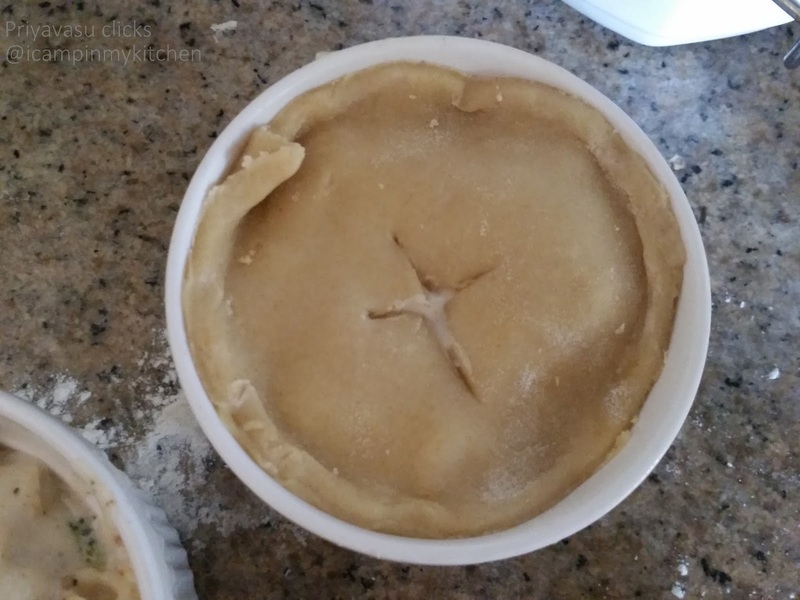 A pot pie is a meat/vegetable pie topped with a flaky pastry. When i was looking for Baked dinner ideas, i thought of making Mac and cheese may be with some veggies. But then something without bread i couldn't consider it to be a filling dinner/lunch. I decided to a pot pie with the same mac & cheese,covering it with a home-made pastry. The recipe i followed used store-bought puff pastry, but i decided to make pastry dough to get a buttery,flaky bread on top. Pastry dough is from Martha Stewart, worked like magic, the final dish was deliciously with a flaky pastry and gooey cheesy, mac & broccoli inside. It fitted the filling dinner/lunch bill perfectly. 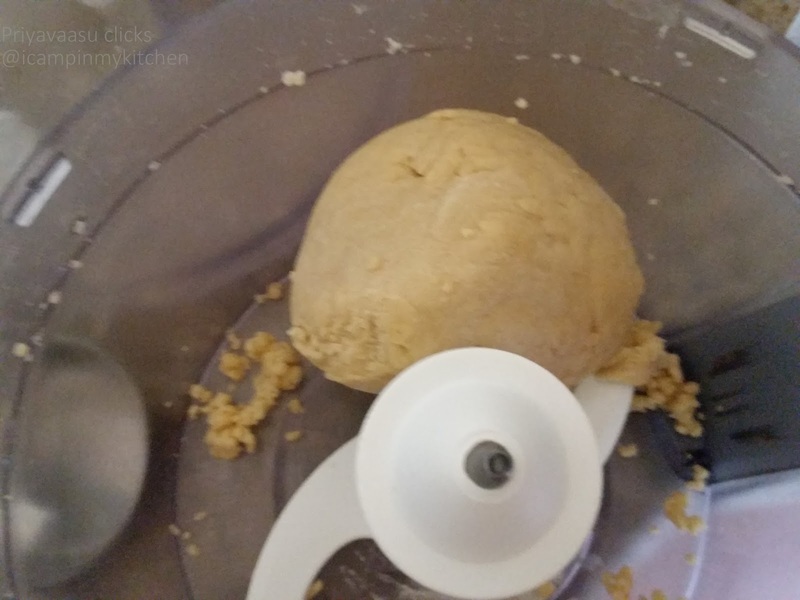 I used my food processor to knead the pastry dough. Take flour, salt and butter in the processor bowl. Run in medium speed for the butter to incorporate well with the flour and resemble coarse texture, like bread crumbs. Add water slowly, 1 tbsp at a time and knead a smooth. The dough should hold together. Remove form the processor bowl, knead a couple of times. Wrap tightly in a Cling-wrap. Refrigerate for an hour atleast, before use. The dough can be refrigerated for a maximum of 3 days. In a large pan, add water and let it boil. Add the broccoli florets, take it off the heat. Let it sit covered for 5 minutes. drain the excess water in a vessel and keep the florets aside to cool. In same water, allow it to boil first, then add the pasta to it. let it cook al dente. (remember it will be baked again). Drain the excess water and let it sit with broccoli. 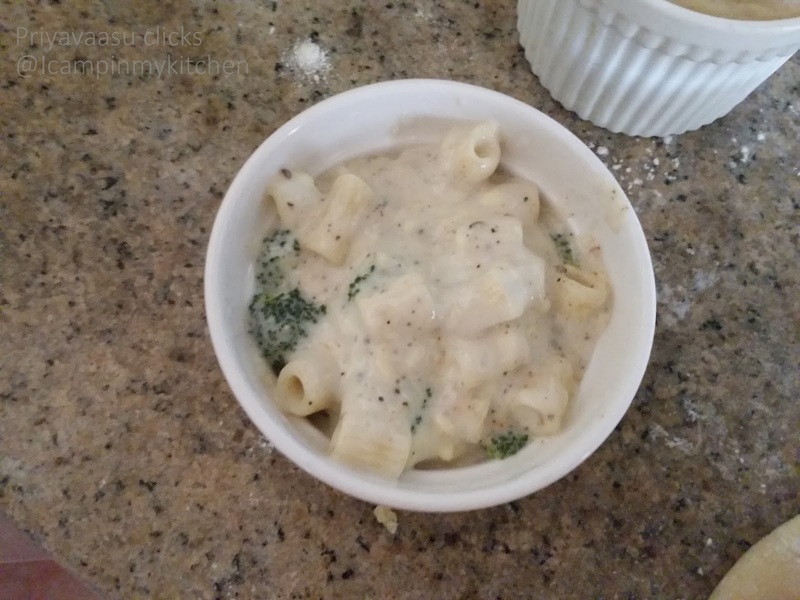 To Make the white sauce, stir in the flour to milk together, lump-free. Take it to the stove and heat it. Keep a whisk ready and whisk often to break any lumps forming. The liquid will start thickening in minutes. when it is about to boil, take it off the stove and stir in the cheese and mix well. The sauce might be thick now, but it will be fine when it is getting baked. To this again add salt and pepper and check the taste, adjust any seasoning if required. To this sauce, add the boiled broccoli and pasta, give it a good mix. 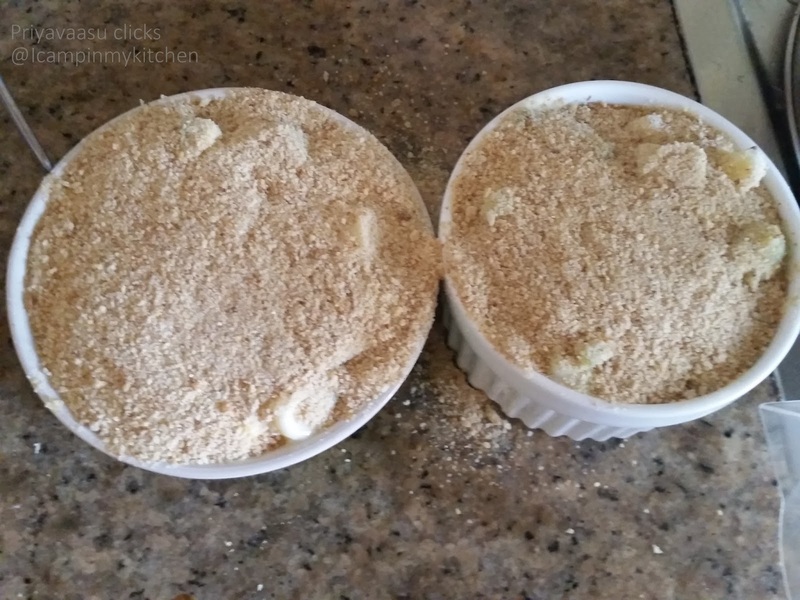 Divide the mixture into ramekins or any baking dish you plan to bake this with. I planned individual portions. so used 2 deep ramekins and 2 normal ramekins. Take the pastry dough out and roll out 4 portions of 1/4 inch thick, to cover the 4 dishes, i used 2 dishes with pastry dough and 2 with just bread crumbs. Press the pastry dough on top of ramekins. Make a slit on top like 'X' to vent off the steam. Brush the tops with milk. Preheat the oven to 180C and bake for around 30-35 minutes,until the tops turn golden brown. Once done, remove from the oven, let it cool and come to handlable temperature, just Dig in!!! A voraciously hungry would enjoy the big ramekin, whereas somebody eating just for dinner would love that small ramekin. OMG that is such a rich and decadent dinner. Love the ooey-gooey cheesy, broccoli filling. Omg, this pot pies are asking me to grab and have rite now, so cheesy and alluring. Delicious bake.. So cheesy and tempting.. Such a filling meal! White ramekins on white looks so good. Nice pictures. such a yummy filling in this.. Surely baked to perfection!..great choice! Rich and delicious. I love the single serving containers you have used. Love how you have incorporated mac n cheese in this dish. My daughter is going to love this. Wow! That looks so good Priya!! Kids will love it for sure! Very rich and calorie laden pot pie. My kids will be very happy with these..
What a super idea to bake these in ramekins,, must try to serve this way . Looks interesting and tempting. Nice idea of baking it in a ramekin bowl..a tempting and delicious one.